Every time you copy images captured on your camera to your hard drive, you are suffering ingestion. Small microbes residing on your system gobble up your images as soon as they appear on your desktop, digesting them and eliminating them in one or another place for you to dispose of. Sometimes this happens just the way you want, of course. But often, it's the result of installing some application that's so helpful it takes over your import process. Almost everything does it. The operating system, cataloging programs, image editors. You pop a card into your card reader and they take over. Some heavy ingesters (George Jardine comes to mind) codify their own ingestion preferences. When they insert a card into a reader, their software takes over doing whatever it is they want. Count us in that group. When you review software, you can't let it take over your import process. You have to have a library of images independent of any particular software's domain. We know, we know. Some people enjoy being scared out of their wits. They ride roller coasters and scream or write code and, um, scream. And other people prefer to watch. But this isn't roller coaster science. It's just scripting some commands you might use manually. If you're game, we'll explain what we do. Subscribers can use the Feedback button below to get a copy of our script to customize for their own use. Our Ingest Script. Overlaid on Image Capture. Click to see the sequential prompts. Our photo archives consist of folders named for each year that contain folders named for each shoot. The shoot naming convention is CCYY.MM.DD Slug where Slug is a short description of the shoot. The files themselves are never renamed. By design they don't have to be. The enclosing folder makes them unique from any other file with the same root name. The date on the folder keeps them sorted and tells us all we want to know about time. The slug makes it as easy to look for them as a keyword. When we want to find all our old Thanksgiving images, we just look for Thanksgiving in the folder name. If we're using a Lightroom catalog, for example, it takes just seconds to create the filter and see every Thanksgiving shot we've taken since 1998. These folders represent camera originals, the negatives, more or less, except that we no longer store proprietary Raw formats but DNGs. And what isn't a DNG these days is a smartphone JPEG. We don't, in short, want any processing applied to them. 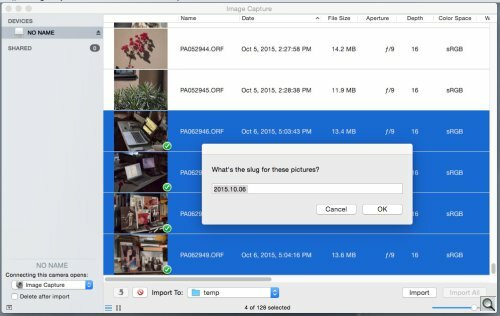 Image Capture launches when a card is mounted and we select the images we want to copy from the card. It's always everything from the latest shoot but we don't delete the images from the card until it's almost full. It's our time-honored method of wear leveling. But you could just as easily open a Finder window on the card and select the images by date. Image Capture isn't essential. The selected images are dragged to a watched folder that runs our script. The script's first task is to prompt for a destination folder for the images that will be processed. A prompt with the current "CCYY.MM.DD " as the default is presented, waiting for us to add a slug. That folder gets moved around depending on 1) whether it has been backed up to several attached external drives and 2) whether it has been burned to DVD. So it can reside in three places but it starts in the Pictures folder. Then the script asks a simple series of conditional questions about how to process this set of images. The default answer to each question is the most common answer. We prefer this interview approach, which typically requires typing one word and a few returns, to the scattershot import options in Lightroom, which are easy to miss (seems like there's something in every corner and presets to store before you can do anything). But it's also very flexible. If we didn't take the photos, we can apply someone else's copyright information for example. Sometimes we don't want to convert to DNG (usually because we're testing software that handles Raw files but does not support DNG). Sometimes we want to save the Raw files for comparison with the DNGs. Sometimes we may want to save disk space by using lossy compression. Nothing forces you to do anything and because you are asked a series of questions you can quickly dismiss, you won't accidentally skip anything. We've never had to rerun an import because we answered a question incorrectly. Then the script processes the files in the watched folder using shell scripts that call ExifTool and optionally DNG Converter, writing them to the destination folder and reporting what it did. Report. How many images, moved to which folder, what conversion has been done and how many images were updated with a copyright notice. The information in the report has, over the years, been helpful in diagnosing various issues with Raw formats or JPEG corruption. So it isn't just a list. It's usually a confirmation that what you wanted was actually done. In some cases ExifTool repairs the Exif headers of some manufacturer's file. In others DNG Converter makes older camera formats compatible with current image processing software. We've had trouble just importing these DNGs into Lightroom when applied auto tone adjustments to it. Nothing wrong with the DNGs but Lightroom really ruined the imported images. So our ingested files were unbothered. The real advantage of this simple scheme is that we can modify it at will if we should want to make an adjustment to our ingestion scheme. And because it interviews us, we don't have to worry about configurations or missing a checkbox. The other benefit we appreciate its independence from any application. For example, if you use Software A to import your images, how do tell Software B about them? This way, we maintain an independent, Finder-based photo archive that can be referenced by these other systems as needed. Since we put it to use, we haven't suffered ingestion at all. We almost look forward to it.